Hōō Maru (鳳凰丸) was a western-style sail frigate, constructed by the Tokugawa shogunate of Bakumatsu period Japan in response to the Perry Expedition and increasing incursions of foreign warships into Japanese territorial waters. 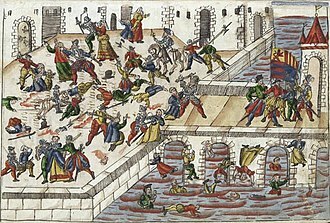 Since the beginning of the seventeenth century, the Tokugawa shogunate ruling Japan pursued a policy of isolating the country from outside influences. 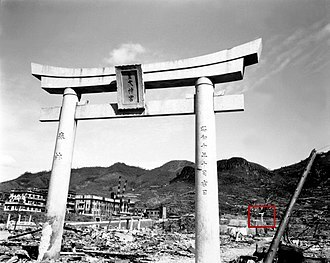 Foreign trade was maintained only with the Dutch and the Chinese and was conducted exclusively at Nagasaki under a strict government monopoly. No foreigners were allowed to set foot in Japan, and no Japanese was permitted to travel abroad. In June 1635 a law was proclaimed prohibiting the construction of large, ocean-capable vessels. However, by the early nineteenth century, this policy of isolation was increasingly under challenge. In 1846, an official American expedition led by Commodore James Biddle on an official mission with two ships, including one warship armed with 72 cannons, asking for ports to be opened for trade, but his requests for a trade agreement were refused. Following this incident, a western-style sloop, Soshun Maru was constructed at Uraga, partly based on observations of Biddle’s ship by local shipwrights. 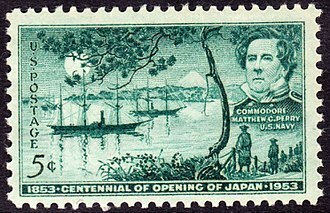 Following the July 1853 visit of Commodore Perry, and intense debate erupted within the Japanese government on how to handle the unprecedented threat to the nation’s capital, and the only universal consensus was that steps be taken immediately to bolster Japan’s coastal defenses. 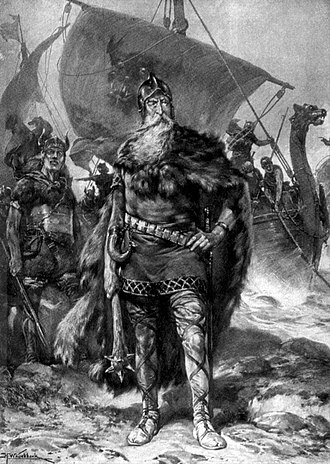 The law forbidding construction of large vessels was repealed, and many of the feudal domains took immediate steps to construct or purchase warships. These included the Shōhei Maru constructed by Satsuma Domain and the Asahi Maru constructed by Mito Domain. The Uraga bugyō, Nakajima Saburosuke (中島三郎助) also received permission from senior rōjū Abe Masahiro to build a new vessel. The project was headed by Nakajima and the local yoriki and dōshin, although the actual design work on the vessel was done by local shipwrights. The construction of the new vessel started 0n October 23, 1853, and was completed in June 6, 1854. Hōō Maru was a three-masted barque-rigged sailing vessel, with an overall length of 36.4 meters. Of wooden construction, her hull was painted with red lacquer, and she was sheathed in copper to the waterline. Her armament consisted of ten muzzle-loading cannon (4 large, 6 small). Her sails had black bands, which was characteristic of Tokugawa naval vessels. 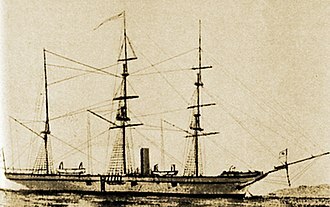 Hōō Maru was already obsolete by the time of her completion, and although she handled well, she was no match as a warship for the steam-powered vessels of the western powers. She was used primarily as a troop transport by the Tokugawa Navy. During the Boshin War, she escaped Edo prior to its fall to forces of the Satchō Alliance, and went to Sendai Domain, from which she joined Enomoto Takeaki’s fleet and sailed for on December 1868. After the Naval Battle of Hakodate Bay, and the fall of the Goryōkaku, she sailed on July 15, 1869 with 305 colonists for Muroran, where she was seized by the Japanese government. After the Meiji restoration, the new Meiji government assigned her to the Ministry of War and subsequently to the Ministry of the Treasury. Beasley, William G (1972). The Meiji Restoration. ISBN 0804708150: Stamford University Press. Abe was instrumental in the eventual signing of the Convention of Kanagawa in 1854, and other unequal treaties shortly afterwards. 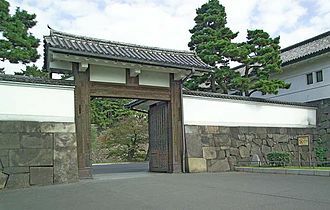 Abe Masahiro was born in his familys residence outside Edo Castle and he was the 5th son of Abe Masakiyo, the 5th daimyō of Fukuyama Domain. 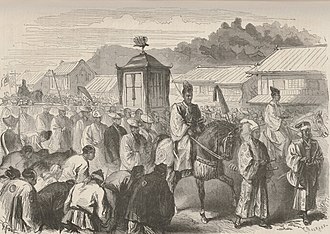 Upon his fathers death in 1826, his elder brother Masayasu became daimyō of Fukuyama, Abe was moved to the domains naka-yashiki in Hongō, however, in 1836, Masayasu adopted his brother as heir. Abe became clan leader and daimyō of Fukuyama upon his brothers retirement in on December 25,1836, in early 1837, he left Edo and made the long journey to Fukuyama to formally enter his domain. This would be the time that Abe set foot in his domain. 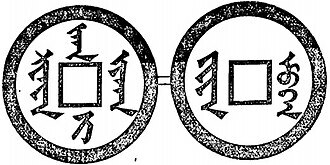 Abe was appointed to the post of sōshaban on September 1,1838, on May 15,1840, he received the post of jisha-bugyō. 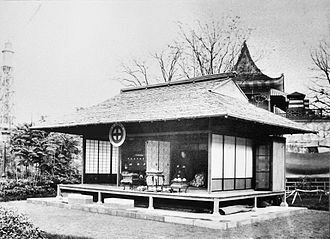 One of his acts was to order the destruction of the Nichiren sect temple of Kannō-ji, in September 1843, Abe became rōjū at the young age of 25, moving his residence to the Abe familys estate at Tatsunokuchi, outside Edo Castle. He became rōjū shuza in September 1845, after Mizuno Tadakuni lost his standing over the failure of the Tenpō reforms, Abe held this position throughout the administrations of Shogun Tokugawa Ieyoshi and Tokugawa Iesada, working to unify shogunal politics. 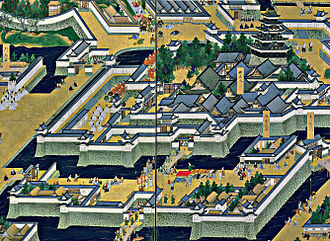 He supervised the reconstruction of the enceinte of Edo Castle in 1852. 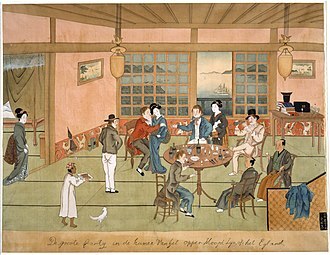 Perry arrived with four warships at Uraga, at the mouth of Edo Bay on July 8,1853, despite years of debate on the isolation policy, Perrys letter created great controversy within the highest levels of the Tokugawa shogunate. Attempting to legitimize any decision taken, Abe polled all of the daimyō for their opinions. The results of the poll failed to provide Abe with an answer, as of the 61 known responses,19 were in favor of accepting the American demands, and 19 were equally opposed. 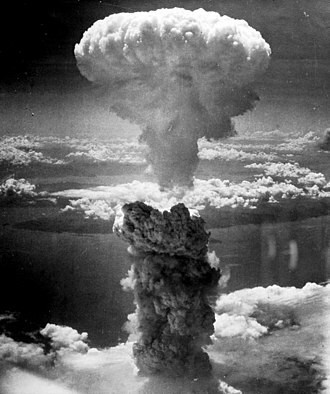 Of the remainder,14 gave vague responses expressing concern of war,7 suggested making temporary concessions. Perry returned again on February 13,1854, with a larger force of eight warships. Kasuga Maru was a Japanese wooden paddle steamer warship of the Bakumatsu and early Meiji period, serving with the navy of Satsuma Domain, and with the fledgling Imperial Japanese Navy. She was originally named Keangsoo, and was a dispatch vessel built for the Imperial Chinese Navy. She was constructed in 1862 by Whites at Cowes, she formed part of the Lay-Osborn Floatilla during the Taiping Rebellion, Keangsoo was the largest of the vessels which made up the Lay-Osborn Floatilla. She was 241.5 feet long overall, had a beam of 29 feet and her engines produced an average cruising speed of 16.9 knots, while on two boilers she could operate at an average speed of 14.2 knots. The main armament on the vessel were two mounted smoothbore muzzle-loading 68-pounder guns and her secondary armament consisted of four 18-pounder long guns. Keangsoo was a dispatch vessel, laid down at Whites shipyard at Cowes on the Isle of Wight in 1862. 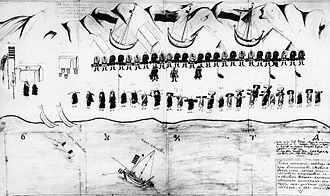 Whites had become known for winning contracts with the Ottoman Navy during the 1850s. Prince Gong of the Qing Dynasty gave permission for Lay to proceed with this task, while some, such as HMS Africa were purchased from the Royal Navy, Keangsoo was one of three dispatch vessels alongside Tietsin and Kwangtung which were procured as new builds. 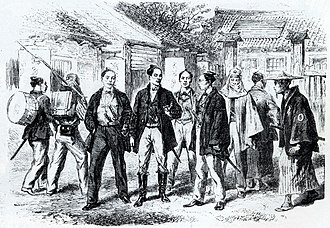 Keangsoo underwent trials in May 1863 while underway to China, however and Osborne agreed that Osborne would only accept orders from Lay, and he in turn would only pass orders on from the Chinese Government if he agreed with them on an individual basis. 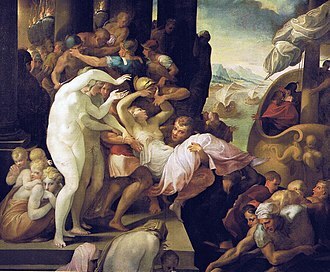 The ships reached Shanghai in September, and the Chinese refused to provide stores or funds since Osborne would not accept a new Chinese commander, when the authorities attempted to bribe the enlisted men from the fleet to join them, Osborne sent it to Chefoo. Following the intervention of a British minister, the fleet was ordered to depart for India with Osborne taking Keangsoo, Kwangtung and the yacht Thule to Bombay. The Keangsoo was laid up alongside the remaining vessels of the flotilla. Kanrin Maru was Japans first sail and screw-driven steam corvette. She was ordered in 1853 from the Netherlands, the only Western country with which Japan had diplomatic relations throughout its period of sakoku, by the Shoguns government and she was delivered on September 21,1857 by Lt. Willem Huyssen van Kattendijke of the Dutch navy. The ship was used at the newly established Naval School of Nagasaki in order to build up knowledge of Western warship technology. Kanrin Maru, as a steam warship, represented a new technological advance in warship design which had been introduced in the West only ten years earlier with HMS Rattler. The ship was built by the shipyard of Fop Smit at Kinderdijk in the Netherlands and she allowed Japan to get its first experience with some of the newest advances in ship design. Kanrin Maru was accompanied by a United States Navy ship, the Powhatan, the official objective of the mission was to send the first ever Japanese embassy to the US, and to ratify the new treaty of Friendship and Navigation between the United States and Japan. 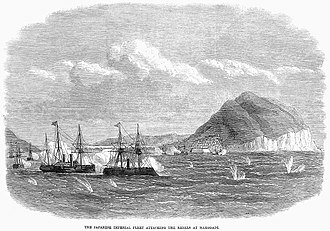 It was one of the last stages of Battle of Hakodate during the Boshin War, and occurred near Hakodate in the northern Japanese island of Hokkaidō. The naval forces of the Ezo Republic were grouped around the warship Kaiten, the fleet originally consisted of eight steamships, Banryū, Japanese gunboat Chiyoda, Chōgei, Kaiyō Maru, Kanrin Maru and Shinsoku. However, Kaiyō Maru and Shinsoku had been lost in an engagement in front of Esashi. The loss of two major units seriously weakened the Ezo Republic side. For the operation, an Imperial Japanese Navy fleet had been constituted around the recently acquired ironclad warship Kōtetsu. Other Imperial ships were Kasuga, Hiryū, Teibō, Yōshun, Mōshun, the nascent Imperial government started with a much weaker navy than that of the Ezo Republic, both in terms of vessel strength and training. 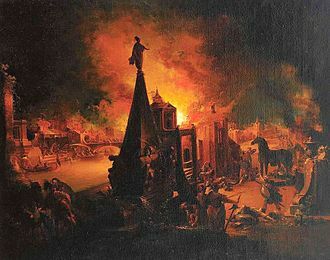 In addition, the Imperial government received the support of two transportation ships chartered by the United States for the transportation of its troops, the Imperial fleet supported the deployment of troops on the island of Hokkaidō, destroyed onshore fortifications and attacked the rebel ships. A statue of Enomoto Takeaki in Tokyo. Members of the Japanese Embassy to the United States (1860), who sailed on the Kanrin Maru and the USS Powhatan. Fukuzawa Yukichi sits on the right. One of the cannons of Odaiba, now at the Yasukuni Shrine. 80-pound bronze, bore: 250mm, length: 3830mm. 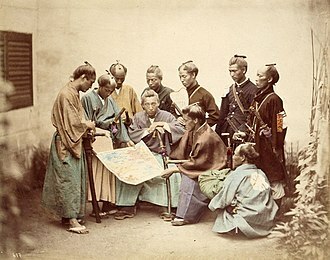 Officers of the Kasuga, in August 1869. Third-class officer Tōgō Heihachirō is dressed in white, top right. Encounter between the Kasuga Maru of the Satsuma navy (forefront), and the Kaiyo Maru of the Tokugawa Shogunate Navy (background), during the Naval Battle of Awa. Brooklyn Museum – Commodore Matthew Perry's "Black Ship"
Portuguese black carrack in Nagasaki, in the early 17th century.